NIGER. Tenere’s desert The “unknown” is the translation of the Indian population, the Kel Tamasheq better known as Touareg. They were nomads in the past, but now almost all of them are sedentary and the most important settlement is Agadez. It’s from Agadez that our routes start and finish. The routes join the offroad tracks going through the dunes of Erg of Bilma; or on the Tafassasset, a wide and enormous plain; or on the massive volcano of Air sometimes incredibly green from the natural springs. Meeting the Azalai, the salt caravan which is composed of hundreds of dromedaries walking very slowly, in silence, they connect the Kaouar salt lake with the market in Agadez. We will take an excursion to the Djado plateau. The presence of natural rocky spires emerging from the sand has formed wonderful cathedrals. The ruins of the ghost villages of Djaba and Djado are still a testimony to the old caravan routes that connected the Mediterranean side to ‘Black Africa’. 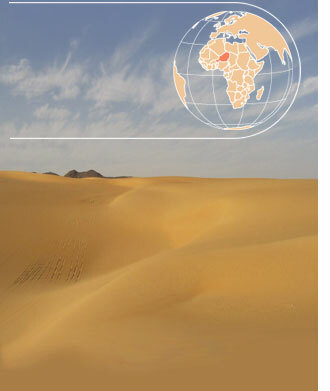 The route we will take offers one of the most fascinating deserts of the world and will introduce us to an ancient culture, the history of the population and of its land. Numerous sites, dating back to the Neolithic period, are showing Litici artefacts and rock paintings. A site of worldwide importance is Gadoufaoua, the dinosaur’s cemetery. On the sand surface you can see fossils of dinosaur skeletons, giants that lived millions of years ago. Meeting various ethnic groups in the oasis or at the Agadez market will give us the opportunity to better know the vivacity and the dignity of this population principally consisting of the Touareg, Peul Bororo, Kanuri, Tubu and Hausa peoples.